Having read all the books in this genre, I'm particualarly impressed with this one written by Lindsey Biel and nancy Peske. The book is PACKED with information and I find myself using it often as a reference. The authors start with understaning your child (and I find this helps understand yourself and family too!). They explain the seven senses in detail and how and why their functioning is important and how their senses alter their behavior. The next section is about working with Occupational Therapists and how YOU can help your child at home, in school and in the community. They go through EVERYTHING; from eating (at home and in restaurants - including special feeding issues! ), potty training, the dreaded birthday parties and family get togethers, and much more... How to decorate and make your house more sensory friendly is explored as well as how to advocate for your child in their school. It's seriously a one stop shop book. There is too much info for me to list - it's all in there. The writers are clear and discriptive, making a sometimes difficult subject matter easy to understand and apply to your every day life. A MUST READ section is "Quick Tips for Calming an Overwhelmed Child." Thank you, thank you, thank you for this priceless advise. This book is fabulous! This book is a very complete reference for parents who have a child severely affected by sensory disorders. (Or, I suppose, individuals.) It had a ton of information and ideas for seeking therapy or dealing with school issues. The book does throw out a number of concrete examples of things that can be done to help with a variety of sensory issues. My biggest gripe is that I don't think it had very specific information for children who might have sensory difficulties, but aren't likely to seek out professional treatment. (Sensory disorders appear to be functional to me - that is, everyone has weird sensory processing to some degree, and only in some of those people does it cause enough trouble to get a professional diagnosis and expensive treatment. In my case, I am reading to help figure out how to address some problems that are mostly likely sensory related, but not terribly severe.) I found it a bit frustrating that most of the home-solution ideas seemed to be good for ANY child, and it was hard to match up which techniques to use for which sensory-behaviors. (Do we do this for hypo, or hyper sensitivity? etc. )Still, I think it is well worth the time for someone who feels like they may have to deal with these problems, even if further research for more specifics for their individual problems will be needed. Tremendous store of good advice based in evidence and experience. I have almost nothing negative to say about this enormously helpful book.Almost -- though I'm not sure this counts as negative. There is so much useful information packed into the almost 450 pages, that I felt it overly dense and text-heavy at times. I wished they had spaced it out more (bigger text and smaller sections or over two books), added more pictures generally and more clearly separated out the helpful tips from the theories for quick reference.In some ways, this is less a book that you'd read from front to back in a few sittings, as a 'recipe book' that you keep nearby and reference frequently, thumbing through your favourite sections and helpful 'to do' suggestions many, many times because you simply can't remember all the goodness the pages contain.Highly recommend. In fact, I found it useful for both my child with special sensory needs (autism) and for my neurotypical child. Let's face it, good tips for working with kids are good tips for everyone. This book was empowering. My child has sensory issues, but doesn't quite fit any "mold" of a child with sensory integration issues. I've read the Out of Sync Child, and it was okay. This book almost made me hyper because it gave me so many ideas that would benefit my child and those that I work with professionally. 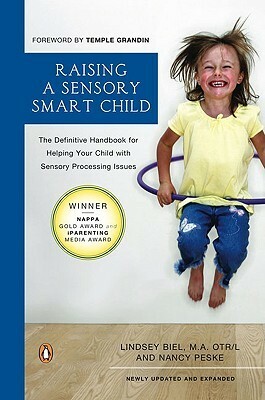 It was by far the most comprehensive, user friendly, and applicable book on sensory integration that I've read to date. I actually ENJOYED it. I highly recommend it to anyone who has a child with sensory issues or sensory issues themselves. Very informative and user friendly. This is THE definitive parenting book for those raising a child with serious sensory issues. It actually helped me be a better partner to our pediatrician and our occupational therapist. It was sometimes emotionally difficult to read but well worth it. This was a helpful read. I learned ways to help my child who struggles with Sensory Processing Disorder. It took several years for me to pinpoint what was bothering my daughter and making her act out. It's been so reassuring and validating to be able to learn about SPD and how it can affect kids. Good resource for parents and teachers. This is a fantastic book for learning about sensory processing disorders. I recommend it to anyone who spednds time around children. I really learned a lot about my two young boys and how to deal with some of their issues and also learned things about myself thathatg I never realized before! Comprehensive look at sensory issues with children and how to help. Massive amounts of situations and solutions. Highly recommend to parents, teachers, and caregivers. The best book about sensory child development book I have read so far. I picked this book on recommendation from Willa. While I don't see any Sensory Issues with my son, I do see the need for more activation of the senses, and he needs more sensory in his life. This book has a wonderful list of suggestions for a "Sensory Diet", and also a list of top 50 toys. It's interesting how so many of the suggestions follow along a Montessori classroom/philosophy. I took extensive notes, because I can see how I need to be intentionally planning sensory activities within his school days. This books offers a lot of encouragement and details on how to handle specific sensory challenges that come up at different ages and stages. Super helpful information and resources. I will be going back to this book again and again for help with picky eaters, calming techniques, and even ideas for more peace for myself! Great section on teen and adult needs, which you don't often see in these books. Great book with lots of strategies. As an early childhood teacher, my experience is that all little ones have some sensory struggle that makes their life more difficult, even if it's something minor. This book has a tip for virtually every behavior you can think of. As a parent of kids with mild sensory issues, I'm finding this book invaluable. I'm especially grateful to the authors for addressing sensory needs from very early childhood to adulthood. Very well done and very thorough resource for parents with a child with sensory integration issues. In truth I skimmed much of this as I am a grandparent of a toddler undergoing therapy for some sensory integration issues so much of the book was not pertinent for my role. Nevertheless, it's very reassuring, supportive and straightforward in describing the various sensory issues, therapeutic approaches, developmental issues and challenges. This book was kind of a jumping off point for sensory issues. Which was good, but I felt like I now need to kind of dive in and I'm going to need more resources. I think I have 2 children with mild sensory dysfunction and I'd like to help them out. I wanted this book to tell me what to do, but I suppose that's a difficult thing to get from a book. This book is great for getting a better understanding of sensory processing difficulties! As an occupational therapy student, I found it more helpful in understanding SPD than most of my text books and it was packed full treatment ideas that can be beneficial for both the family and therapists to use. It was also an easy read that was informative, but not boring. This book gave me great insight into how sensory disorders can cause various behaviors in children. I also gained tools and ideas to help give my child with SID, the sensory input or reduce sensory input depending on his behaviors and environment to help him develop the skills to recognize when he was needing one or the other. This is fantastic for understanding the disorder if you're first being introduced to it and gives great ideas with how to handle children that suffer form this disorder (although realize it's not a disease and thus cannot be cured) If you work w/ sensory problematic children OR have them on your own-please read! You won't regret it. Wow, this book has such great hands on practical suggestions that you can apply immediately. Even if your children don't have sensory issues, this book can still have some really helpful activity suggestions for parents who have "active" kids. I only wished I had had a copy of this book 3 years ago! This book is a great help in understanding sensory integration dysfunction. It provides a different perspective and some different information than Sensational Kids. I especially liked the sections on how sensory problems can cause delays in other areas, such as speech. I also liked the resources provided (activities and toys to address each type of sensory issue). I really liked this book for it's perspective and it's suggestions. Anyone with a child with SPD or any parent for that matter can learn how to best help their child when difficult sensory experiences arise. There is an answer out there and there is help. This book has helped me tremendously. It has helped me to better understand, prepare, and help my son with the sensory issues that he struggles with daily. Outside of his OT, it has been the single greatest resource for answers and solutions. This book is helpful, well-written, has a nice tone, and a great introduction to sensory integration issues. Having said that, I hated reading this book. I don't enjoy reading books in the "what is wrong with my child" genre, particularly when they are telling. alas. This is an awesome book to up understand the new disease children are facing, Sensory Processing Disorder. It goes into great detail on how to handle, work with them and most importantly love them. While some of the advice could be clearer, I have to say this is a far more readable book on sensory integration. I would recommend it to everyone. Although much of the book wasn't applicable, I still found it to be interesting and filled with great ideas. this book is a fantastic resource!!! Having a child with Sensory Processing Disorder, I found this book to be an invaluable resource. This book is very insightful and informative. I feel much more in control and calm after reading this book. I feel more confident that if my son does have sensory issues (as his school has suggested) that in the long run, he'll be okay. Excellent! The most helpful, practical book I have read about sensory processing.